Target 1 Zombie monster in your GY and 1 monster in your opponent's GY; Special Summon the first target, also banish the second target. 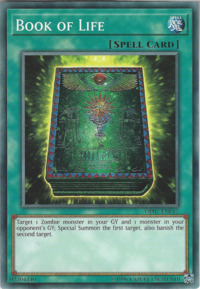 This card is a reference to the real ancient Egyptian book, the Book of the Dead. This book supposedly helped people in their journey to the after-life. Thus, this card being the Book of Life would similarly help people return to the world of the living. This card has three other counterparts: Book of Taiyou, Book of Moon and Book of Eclipse". This is the only card out of the four that does not change the battle position of monsters. This card is also the only one with effect that affects only one specific Type - in this case, Zombie. The effects targets the two Monsters. If "Imperial Iron Wall" is active, "Book of Life" cannot be activated. If "Imperial Iron Wall" is chained to "Book of Life", then the Zombie-Type monster will still be Special Summoned, but the other monster will remain in the Graveyard. : While "Imperial Iron Wall" is active, can you Special Summon a monster with "Boof of Life"? You cannot activate "Book of Life" if there is no monster in the Graveyard to remove from play. You cannot activate "Book of Life" if your opponent controls "Kycoo the Ghost Destroyer". If you activate "Book of Life" and your opponent chains "Call of the Haunted" to Special Summon "Kycoo the Ghost Destroyer", you still get to Special Summon 1 Zombie with Book of Life's effect (but do not remove 1 monster from your opponent’s Graveyard). Imperial Iron Wall: "Book of Life" cannot be activated while "Imperial Iron Wall" is active. If "Book of Life" is activated and "Imperial Iron Wall" is chained, the Zombie-Type monster is Special Summoned, but the opponent's monster is not removed from play. Necrovalley: If "Necrovalley" is active, neither player may activate "Book of Life".